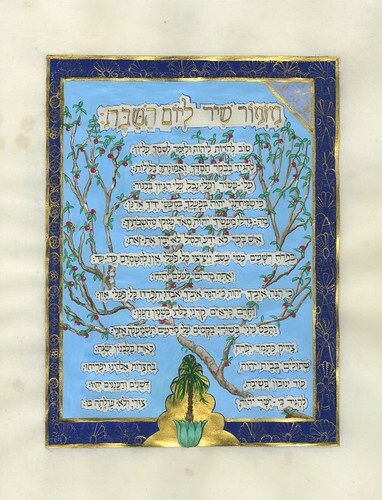 The Walled Garden Ketubah likens marriage to the beauty and intimacy of a walled garden replete with fruit and blossoms. 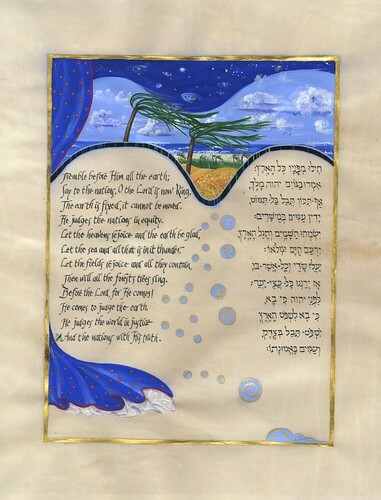 Its symbolism, drawn from across Jewish text and lore, is depicted with brilliant color and papercutting. 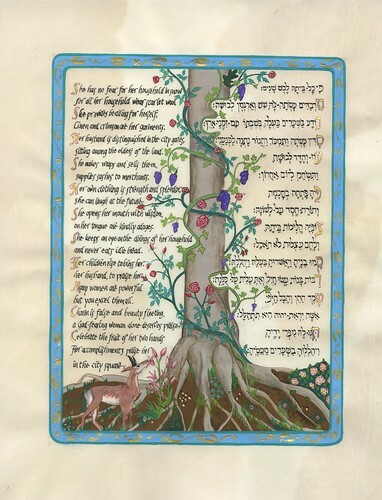 Printed in brilliant color and stamped gold on fine, heavyweight paper, the Walled Garden Ketubah is available in several text versions detailed below. 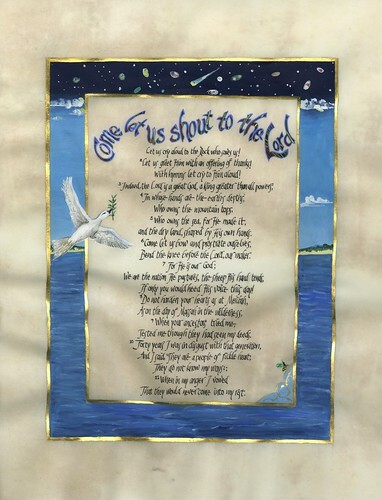 Your ketubah will be accompanied by a decoratively printed copy of the following About the Ketubah description. 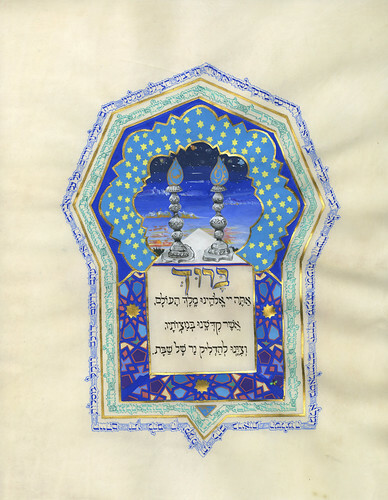 The ketubah, or Jewish marriage contract, is part of a tradition dating back to the times of the Mishnah, the codification of Jewish law during the first and second centuries of the Common Era. The traditional text used today dates from the eleventh-century Rhineland. The Conservative movement has added a clause prepared by Rabbi Saul Lieberman relating to divorce rights. In recent years, personal ethical and romantic pledges in English have become frequent additions to American ketubot. In the Reform movement such egalitarian Hebrew texts frequently replace the traditional formula. 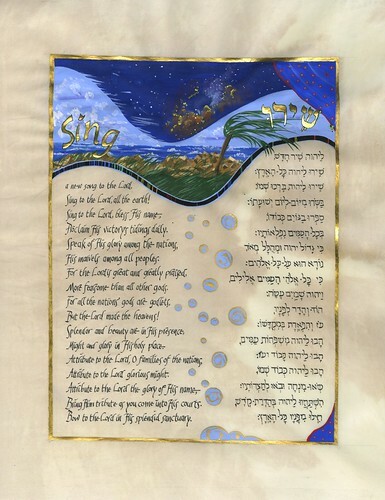 This ketubah is reproduced from an original which I created using gouache, egg tempera, gold and papercutting. The design is based on Biblical allusions to beauty, joy and fruitfulness, and the love of Jewish tradition. 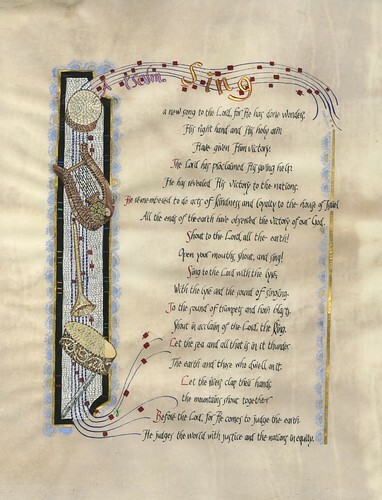 The passage from the Song of Songs 6:1-3, culminates in the celebrated declaration “I am my beloved’s and my beloved is mine.” The full passage is worked into the inner and outer borders of the artwork. 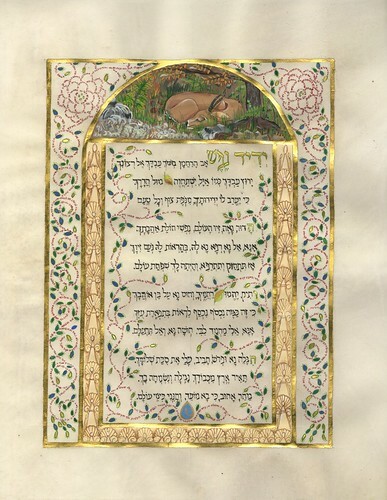 Elsewhere in the Song of Songs, the man describes his lover as a walled garden, and together these images form the theme of the decorations of the ketubah. The overall design is that of an Eastern walled garden, with a fountain, pots of lilies, etrog and pomegranate trees and grapevines. Fountains are frequent symbols of the vitality of Torah throughout the sacred Jewish texts, as of course, are trees in general. The trees here, however, have specific meaning. The etrog, used during the holiday of Succoth, is described in Leviticus 23:40 as the “fruit of a beautiful tree.” This tree bears seven etrogim, representing the seven days of the week. The pomegranate, of course, is a ubiquitous Mediterranean fertility symbol, and the tree shown here bears three fruits and four blossoms, representing our ancestors: Abraham, Isaac and Jacob, and Sarah, Rebecca, Rachel and Leah. In the verse worked into the border lilies represent the woman’s beauty: the pots holding the lily plants are worked in an ancient Egyptian lotus pattern, perhaps contemporary with the Song of Songs, itself. Everywhere, grapes symbolize joy, celebration and sanctification. The medallion based on six-pointed stars is worked in red, blue, purple and gold, the colors of the hangings of the Mishkan, the traveling Ark carried through the desert. Finally, the papercut roses in the corner are a reference to beauty drawn again from The Song of Songs 2:2: “I am a rose of Sharon, a lily of the valleys.” Please note that the papercuts on the lithograph are printed. The price for any of the above versions is $200 US. Personalization is available for any of the with-text versions for $75 US . 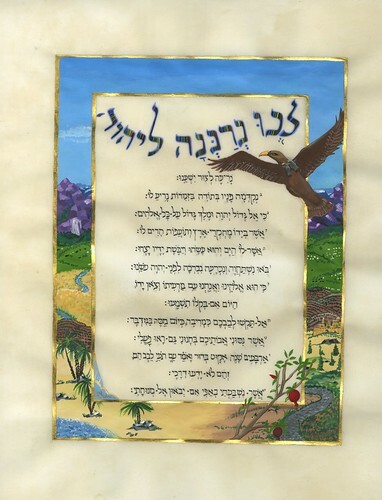 Please allow 2-4 weeks for receipt of the ketubah, although faster service and express shipping are available for a rush fee. The fee for adding a complete customized text to the no-text version will be determined by me upon reviewing the customer’s desired text. The cost of shipping within the continental US is $25. Please contact me for further ordering information. For your convenience, credit card payment is available.